In almost all instances, regular vacuuming of an Oriental rug with an electric vacuum cleaner is good for the rug. A dirty rug wears prematurely, and regular gentle vacuuming helps prevent dirt on the surface of the rug from filtering down into the pile where it can accumulate and cause increased wear. Still, be careful with a cleaner equipped with a power brush or "beater bar." These powered brushes in the vacuum head help the vacuum to do a good job on machine made carpeting, but they cause a raking effect on the top layer of an Oriental rug's pile if used too strenuously. For routine cleaning, use just the plain vacuum nozzle. This is especially important for fringes; try not to run an upright vacuum or a power brush attachment over the fringes. The brush shreds the fringes and causes rapid wear. Frequently fringes get caught and chewed up by the rotating mechanism of the brush, so try to vacuum with the nap of the rug. Rotate your rug as often as possible, at least every 3 to 6 months. Do this more often if you notice that the high traffic areas of your rug are starting to appear dirty, or if the nap has lost its original direction or shape. Also, rotate your rugs according to the amount of direct sunlight they receive, as over time, direct sunlight can fade the dyes of your rug. Rotating your rugs will allow them to wear more evenly, which helps them to maintain their original appearance and value. Having pads under the rugs can prevent sliding of the rugs, prolongs the life of the rug by cushioning the impact between shoe sole and the hard floor surface, and also provides comfort while walking over it. Now the question is to determine if you need a pad? The rule of thumb is: a heavy thick rug does not necessarily need one, whereas a thin, soft rug does, as does an older rug or a rug that has been rewoven or patched or which has a weakened foundation. A pad should be about an inch smaller in size than the rug so that the pad will not be prominently seen. In case of a food spill, the spot should be treated promptly before the spill dries out. Always try to work on the spill spot rather than brushing it, which will make the spill spot spread around. Blot up as much liquid as possible with paper towels or a clean white cloth. Try to rinse out as much of the spill as possible. If necessary, use a tablespoon to scrape up all the material. Blot the area dry and immediately sponge several times with rug shampoo or with a cleaning solution made from a mixture of 1/4 cup white vinegar, 1/2 tsp liquid dishwashing detergent and 2 cups tepid water. Don't scrub too hard; too much manipulation of the pile can spread the stain. Make sure that you sponge in the direction of the nap. Most Oriental rug dyes are acid reactive. However, if you add a little white vinegar to the solution you will make the solution more acidic, and this reinforces the bond between the dye and the wool in the rug. It also helps prevent the colors from wearing away. Finally, sponge the area with cool, clean water. Use absorbent towels or a firm, non- shedding sponge. Don't use a stiff brush, as it will pull out the fibers from the pile. Don't scrub the pile too harshly. Place some towels under the spot to keep the floor or pad from getting wet and then let it dry thoroughly. When the nap feels dry, check the back of the rug to see if the area is completely dry. If a rug has been folded it might wrinkle up or cause creases. To remove the wrinkles or creases, first determine which way the nap lays (rub your hand across the pile in the direction of the fringe; the pile will feel smooth one way and will roughen up when rubbed in the opposite direction). Stand at the end of the rug with the nap running toward you. Roll the rug up from this end as tight as you can, then slowly unroll and smooth it down along the way. When a rug is to be stored for more than a few months it should be cleaned, sprayed with insecticide and wrapped in protective plastic or tough synthetic paper like “Tyvek®” building paper. Don't use newspaper or common brown wrapping paper. These materials are not chemically stable (they are usually quite acidic), and do not provide the protection from insects or moisture the stored rug needs. Make sure the rug is completely dry. Store the rug in a clean, dry place and make sure it’s out of the reach of squirrels or other rodents. Periodic inspection of the rug is strongly recommended. Moths and carpet beetles can destroy an Oriental rug. Check especially the edges and any areas of your rug that might be positioned under furniture for infestation. Act immediately if you see any bugs or eggs. It is possible that you will need to have your house sprayed and all wool rugs cleaned if you find an infestation. Hand Knotted and Hand Woven rugs come in many different qualities and the most common measure of quality is the knot count, also known as knots per square inch (to measure the knot count of any rug simply flip the rug and on the back side count the number of knots in one square inch). This guide will briefly describe the most common qualities. It’s important to remember that knot count is just one of many factors to determine the overall quality of a rug. 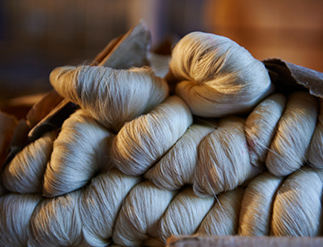 Other important factors are content of fiber, spinning technique, quality of fiber, type of dyes, and the washing process. Hand knotted rugs are primarily made in Nepal, India, Pakistan and China. Hand woven rugs are primarily made in India, Pakistan and China. A rug is an excellent way of drawing attention to a significant space in a large room. Here are a few things to keep in mind about size. If a rug is rather small in comparison to the space, it will not draw the proper attention and can make a room look small. A rug that is too big in proportion to the space will also make the room look small and congested because it will empower the rest of the details in the room. Living/sitting rooms are often the ideal place for a rug because it can bring a sense of oneness. The best placement for such areas is centered among the seating furniture (in front of the sofas and/or chairs). In such cases, the rug should ideally be longer and wider in comparison to the furniture adjacent to the rug. It should also not be placed too far from the seating, as it brings in the area to make it look more “comfortable” throughout the space. Another common way to place a rug in a sitting room is halfway under the sofas or chairs; back legs off the rug and front legs on the rug. Do not place the rug under tables or cupboards, as they become unbalanced. An alternative for big rugs is to place all the furniture on the rug, leaving sufficient space around the room behind each furniture piece to avoid making the pieces look disconnected. Be extremely careful about doors in the space; if the door opens into the room, make sure it does not come in contact with the rug, or it has at least a 1.5cm gap between the door and the floor. Placing a rug in a dining room can improve the detailing by adding texture and color It also softens the sound in the room and makes it feel warmer and more comfortable. However, it can be difficult adding in a rug to this room because it should in proportion to the table but larger. Picking the right design for the rug is very crucial in this case. because the table and the chairs will occupy the center, the border becomes the important factor of the design. You also have to make sure it is 1.50m larger than the table in each direction, so that there is adequate amount of room to pull back the chairs without having them fall off the rug. For bedrooms, a rug can be placed under the bed, stopping right before the nightstands and framing the entire bed. Another alternative is to place two smaller rugs on each side of the bed, allowing it to be underfoot when getting out of bed. For hallways, the dimensions are normally very specific. Please contact us in order to discuss details. Fitting wall-to-wall can be done with some careful and precise planning.